It’s not easy to describe Steps Ahead — a Franklin-based business that rents out a high-end mobile office — because there’s nothing quite like it. Launched by Franklin residents Carlos and Shenita Baker last spring, the mobile office isn’t a car service, nor is it a party bus. 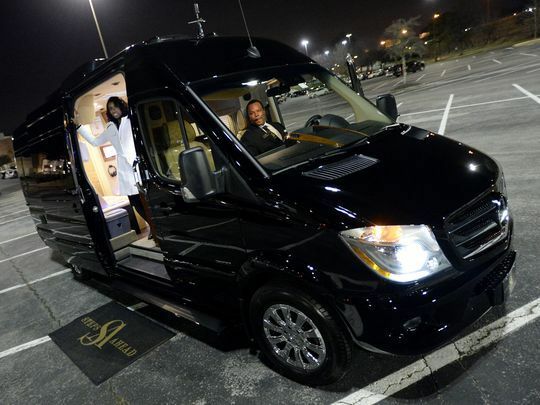 The Mercedes Sprinter, which can fit at least seven occupants and offers the space and technology to accommodate everything from commercial real estate showings to private business meetings, is all about maximizing its riders’ productivity. It took a leap of faith and a $250,000 investment, but the Bakers are confident Steps Ahead is just that — steps ahead of the competition. With more than three decades of experience as a manufacturing engineer for General Motors, Carlos Baker, now retired, frequently traveled to Detroit for business. But time is money, and the constant moving around different plants spread across the city meant frequent interruptions for Baker and his colleagues when discussing new products or design features. “My intuition was to say, ‘Hey, we need something where when we leave the plant, we don’t have to stop the conversation. If we had a vehicle (so) we could actually still be talking through the process when we get to the next plant, (then) we don’t have to start over,’ ” Baker said. Steps Ahead offers an array of accommodations on board, including audio and video conference call equipment, Wi-Fi, satellite television, Apple TV, HDMI hookups, full computer services with dual monitors, full color printing, a shredder, an iPad Pro and a Microsoft surface tablet. Even when commuting from one location to the next, clients can “still continue to run their business, therefore there’s no lost time in productivity and … there’s no net loss because you’re continuing to communicate,” Baker said. The business’s clientele ranges from commercial real estate agents looking to add an edge when showing out-of-state clients prospective Nashville properties, to financiers and investors and corporate professionals traveling regionally. One high-profile client flew his family from Virginia to Nashville in August to see the solar eclipse, and hired Steps Ahead to drive the family around the city. The Bakers have found a niche market with commercial real estate agents, said Shenita Baker, who is also a vice president with Fidelity National Title Group in Franklin. “We have a really good target with them. Some of their clients fly in for a single day and want to see as many properties as possible,” she said. The van’s exterior has 360-degree cameras installed, so even in inclement weather, clients can still see properties on the monitor without wasting any time. 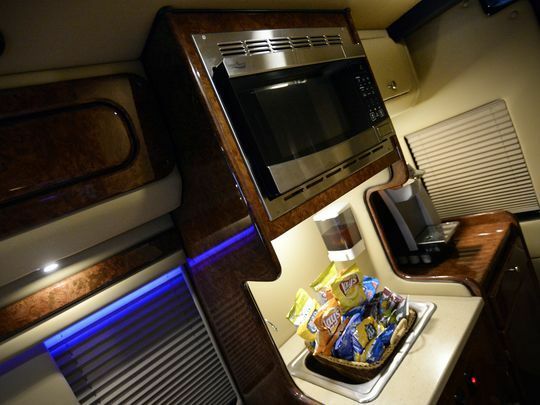 With all its amenities, which also include an on-board restroom, a refrigerator and a kitchenette stocked with drinks and snacks, Steps Ahead is clearly distinguished from your average shuttle. The Bakers are adamant about providing white-glove service at all times. “When they enter that vehicle, everything in there is first class — from the speakers they use to the table and the phones,” Carlos Baker said. The Bakers did extensive research when they first set out to create a mobile office to see what others offered. But as time went on, they realized something: There weren’t any others. Steps Ahead charges a rate of $200 an hour, with a two-hour minimum rental. While there’s no set restriction on mileage, they try to stay within a three- or four-hour radius of Nashville. But they make exceptions, and once drove as far as Washington, D.C., to accommodate clients. The business is looking to hire more drivers, who must undergo criminal background checks, a FBI fingerprinting review and complete hospitality training. Drivers are even certified notary publics. With his engineering background, upfitting the mobile office was not the difficult part, Carlos Baker said. But it was somewhat time consuming, as the vehicle’s nine-month build-out had to be done in Indiana because there were no Mercedes-approved upfitters nearby. Baker says the greatest challenge in launching Steps Ahead was ensuring all the technical devices not only worked, but were also compatible with whatever devices customers brought on board. To ensure passengers’ private information is protected, all the devices and software on board are swept daily. A soundproof partition separates the cabin from the front of the van to help ensure passengers’ privacy. The Bakers’ goal for 2018 is to better tap into Nashville and Williamson County’s economic development market.